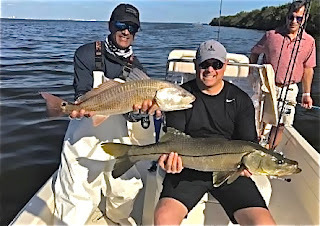 Triple C Charters: FLIPPING THE SWITCH!! hopes of landing a fish within the 27"-33" slot. The dropping water temps also have the trout chewing good on the deeper grass flats along with some stud redfish cruising along the mangrove edges and oyster bars. 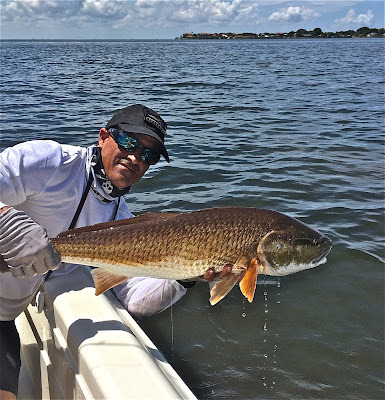 Many of these reds are too big too keep but there are also some large schools of smaller fish in the 20-22" range that are excellent table fare. Speaking of which, the tasty and tricky sheepshead have been filtering into the bay and will continue do due so over the next couple of months. 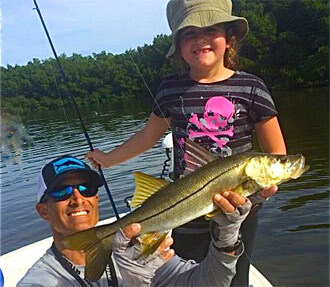 There are some cobia hanging around on the markers and buoys as well as plenty of mackerel, bluefish, jacks and ladyfish feeding on baitfish schools throughout the bay. Further offshore the fall king mackerel run has started strong with big bait schools getting pummeled by birds and fish. Early season sees many of the smaller "snakes" but the big trophy smokers won't be far behind. Its a great time to fish right now with pleasant temps that are forecast to continue. I hope you can find some time to get in on the action!! If you do, call me!! Good times guaranteed! !